Not! Kudos to US Airways for fighting this seditious organization. More legal jihad shenanigans from CAIR reported by Patrick Poole at Pajamas Media, this an attempt by CAIR to pressure the police in Fairfax County, Virginia. "On February 9, Abassi committed an improper turn which prompted a traffic stop by Fairfax County police. After consent for a search of the vehicle was given, police discovered loose pills, needles, and prescriptions written to other individuals in the trunk of the car, violations of Virginia law. Dr. Abbasi admitted that he treated members of his mosque out of his vehicle, also a violation of Virginia medical rules (it should be noted that he is also a U.S. Customs and Immigration Service-approved immigration doctor). Abbasi received a summons for unlawfully prescribing drugs and three others for possession of controlled substances, and was allowed to leave the scene on his own recognizance." "More than two months later, a letter was sent from CAIR national legal counsel Nadhira Al-Khalili to Colonel David Rohrer, chief of the Fairfax County Police Department, claiming that the traffic stop was made on the basis of profiling and that Dr. Abassi’s consent to the vehicle search was never given. She also claimed that Abbasi’s arrest was part of a pattern of 'religious discrimination' by the department." What crap, really, and what a shame and a waste of of taxpayer, county and municipal dollars to have to respond to this crap. The guy made an illegal turn and he was illegally giving out medical prescriptions. Death by a thousand papercuts. CAIR needs to be countersued ten times over. It looked like they were going to tone down the baseless lawsuits that is their MO, copied somewhat successfully by other Islamic groups, including the Islamic Society of Boston. But no, CAIR - with its measly 1,700 members in 2006 - is back to their usual baseless but time-consuming and costly legal jihad. I went to a terrific lecture last night at the Ahavath Torah Congregation in Stoughton. Reed Rubinstein of Greenberg Traurig spoke about the Council on American Islamic Relations, specifically 1) the unsuccessful lawsuit that CAIR brought against Andrew Whitehead of Anti-CAIR and 2) the Muslim Brotherhood/ Hamas origins and ideology of CAIR. There was a decent crowd, approximately 50 or 60 people. Rubinstein asked the crowd if anyone knew who Andrew Whitehead was. I was surprised to be the only person to raise my hand. Weird! Rubinstein was an excellent, engaging speaker and he handed out a CD chock-full of primary sources for the statements he made about CAIR, its officers, its funding, its goals. Much of the info he provided came from the U.S. versus Holy Land Foundation trial held last fall, as well as the Whitehead case. What he has at his fingertips about CAIR needs to be understood by everybody. Especially the media need to know that this terrorist-related organization of 1,700 people does not represent the "grass roots" American Muslim community, and the media should stop going to CAIR for the Muslim viewpoint. They're only legitimizing this "stealth jihadist" group. CAIR is a small, centrally controlled, top-down propaganda organization with a miniscule membership. CAIR is an "Islamist" organization and a child of the Muslim Brotherhood. CAIR is part of the “greater HAMAS-affiliated conspiracy” in the US. CAIR is a purveyor of the “Jew/Zionist/Rightwing conspiracy” meme. Rubinstein recommended giving no legitimacy to CAIR: "cut the media oxygen and there's no more CAIR." FYI, The Investigative Project on Terrorism recently put out a ten-part series on CAIR, which should thoroughly discredit this bogus "civil rights" group. Check it out. Pass it on to your local newspaper editors and congressmen. Spread the word. P.S. God bless the libel laws in the U.S.A. and the discovery process! P.P.S. 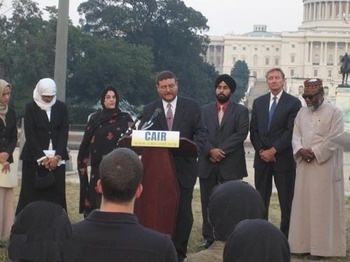 Remember the CAIR-doctored photos from one of their press conference? That's some headscarf! Hilarious! One of the amusing results of the Pew Survey of American Muslims is that the Survey concludes that the estimated Muslim population in the U.S. is 2.35 million. Whaddya know? That's about 5.65 million fewer Muslims than the Council on American Islamic Relations (CAIR) claim of 8 million! CAIR's estimate grows by about 1 million per year, suggesting astronomical rates of immigration, conversion and/or baby-making. CAIR's wildly inflated estimates of the American Muslim population has always been a pet peeve of mine (as I wrote about earlier here), and the Pew Survey exposes CAIR's malarkey. I hope the Pew Survey results serves as a correction factor to journalists and politicians who parrot CAIR's numbers. The Investor's Business Daily refers to "CAIR's fuzzy math" as the "Wahhabi lobby's big lie," and correctly identifies it as an attempt by CAIR to gain political power.